I tried it with my kids and it works. The only difference is that there are some new flavors out that work a little better and different. The pineapple kool-aid makes a great yellow egg (works better than the lemon). I have also tried a bunch of great new food recipes I found on Pinterest. There is now a new saying around The Thrifty Home household: "Is this from Pinterest?" Thank you for hosting! 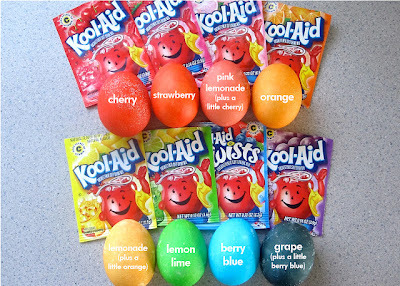 We are off to the store today to get egg decorating supplies and think we will give the kool-aid trick a try. Thanks again so much for hosting, I really enjoy coming to look at all the fabulous thrifty ideas. Thanks so much for hosting! Great kool-aid egg dying~they look so pretty! Thank you for hosting!! I love the kool aid idea for the eggs! Who knew? !